If you are looking for quick and easy dinner recipes and healthy snack recipes then you are on the right place,I am Aashiya Tongia from Indore,India brings weekly recipes for you which can be prepared instantly. 1) Mix grated coconut,sugar,milk in a bowl and cook in slim flame. 2) Stir continuously till it all mixes well and gets thickened. 3) Add cardmom powder and mix well. 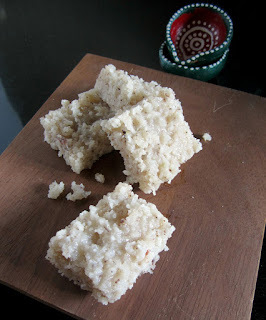 4) Grease a flat surface with ghee and turn over the coconut mixture on it. 5) Spread it evenly on the plate. 6) Leave it aside to set completely and then cut it into pieces of desired shape. 1) Firstly peel off the Mango skin. Now cut the mango flesh into small pieces. Grind them into a smooth puree. Keep this aside. 2) Heat milk in a heavy based utensil keep the gas on low flame and boil till it decreases in quantity. 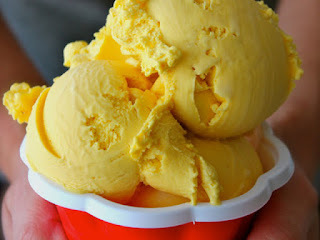 3) Cool the milk, mix the mango puree and cream to this cold milk and beat lightly. 4) Pour into the shallow and wide container, so it freezes quickly. Cover it and keep refrigerated till it is half frozen about 2 hours. 5) Then take out the container from the freezer, cut into pieces, add it to the blender. 6) Blend it till it becomes smooth and in liquid form again. This will break all the ice crystals that formed. 7) Pour it back to in a n air tight container and close the lid properly.Freeze it till sets completely (ice-cream will be almost fully set in 45 minutes to 1 hour depending on the refrigerator). 8) Scoop out into a bowl and serve immediately . 1) Wash and sterilize jars and lids. Place strawberries in a saucepan and stir through sugar. Leave for 1-2 hours while sugar softens the fruit. 2) Then cook over medium heat, stirring constantly, until fruit is soft.Bring this to a boil and simmer for 10 mins (If it is still watery you can put it back on stove and cook for few more min). 3) The jam will be thick now. 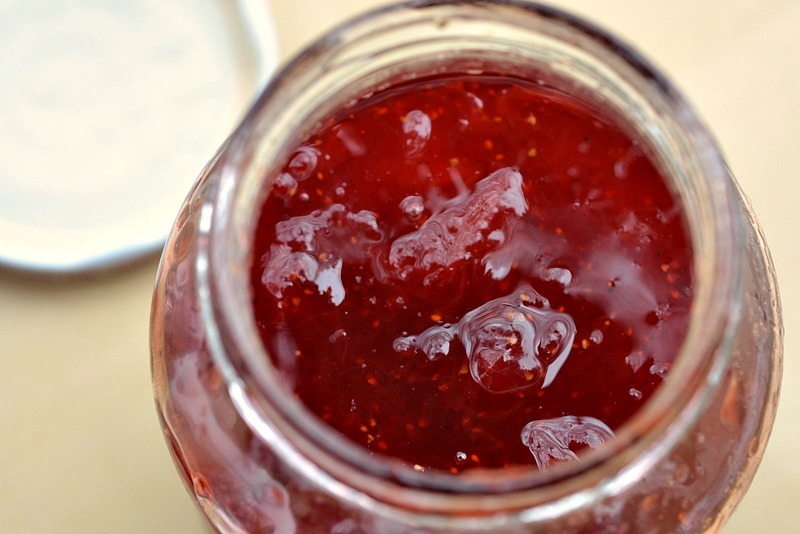 4) At this point you can turn off the heat and let the jam cool completely. 5) Now put this in canning jar then seal with lids. 1) Peel the potatoes first. If you are making potato wedges without peeling them then wash potatoes thoroughly and cut them lengthwise dividing it into 2 equal parts. Take one half and cut into 2 equal parts. Again take one piece and dice it into further 2 equal parts. Likewise cut all potatoes. 2) Take a big bowl and add olive oil, salt, black pepper, oregano and mix well. Add the potato wedges into it and mix until every wedges gets coated nicely with the spices. 3) Preheat oven at 180 degree centigrade. Layer the potatoes over the plate one by one at distance and now place the tray in the oven. Set the oven at 180 degree centigrade for 35 minutes and roast the wedges. 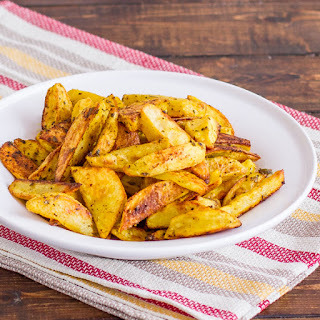 After 35 minutes take out the potato wedges from oven, potatoes are roasted. Potato wedges are now ready. 4) Serve immediately with a dip of your choice. 2) Place potatoes into a large pot and cover with salted water; bring to a boil. Reduce heat to medium-low and simmer until tender, about 20 minutes. Drain and transfer potatoes to a bowl; coarsely mash. 3) Heat oil in a skillet over medium-high heat; cook and stir onions, coriander seed,garlic, ginger, salt, turmeric, cumin, green chilli, until onion is lightly browned, about 5 minutes. Remove skillet from heat and stir peas into onion mixture; pour into mashed potatoes ,garam masala and lemon juice ,thoroughly mix. Cool completely. 4) Assembling the samosas: Roll the samosa dough into 4-5 inch circles, and cut the circle in half with a knife. Using a bit of water, take your semicircle and make a fold in the shape of a triangle. Seal along the fold. 5) Put this cone carefully between your thumb and index finger and place a ball of the filling inside. Wet your finger and run it along the edges of the dough with water and seal to enclose the stuffing, pinching the edges and folding over. 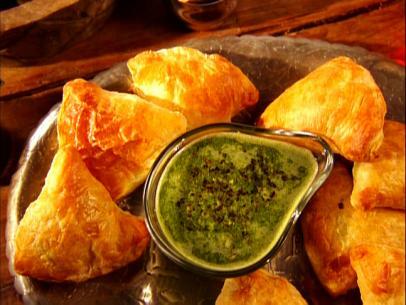 6) Once the samosas are assembled, cook at 350 Fahrenheit for 10 minutes on one side, then flip over and cook for 10 minutes on the other side. 7) Serve the samosas hot out of the oven with the mint cilatro dipping sauce. 1)Heat the butter in a pan. on medium heat. 2)Once hot add cumin seeds and let them sizzle a bit. 3)Then saute chilli garlic paste. 4)Mix in onions,Cook till they are light brown in color. 5)Add tomatoes.Mix well and add ¼ cup of water, so tomatoes get cook fast. 6)Add turmeric powder, red chili powder and pav bhaji masala ,Mix well. 7)Let it cook till tomatoes are almost mushy and oil starts leave the sides of the pan. 8)Add cooked peas.Mix and cook for 2 minutes. 9)Add cooked rice.Mix everything very gently without breaking the rice grains. cook for 2 minutes, so rice gets heated through. 10)Finally squeeze some lemon juice, mix and Garnish with some chopped coriander leaves and it is ready to serve. 1] Grind the cashew pieces and make a powder. (Do this by gently pulsing it in the mixer. Avoid over doing it, else the cashews start releasing their oil and the mixture becomes sticky). 2] Prepare the sugar syrup: In a heavy bottom pan, add sugar and 3/4 cup water and cook to make a sugar syrup of 1.5 thread consistency. Keep stirring the syrup while cooking. 3] Bubbles will start appearing all over the sugar syrup when its done. 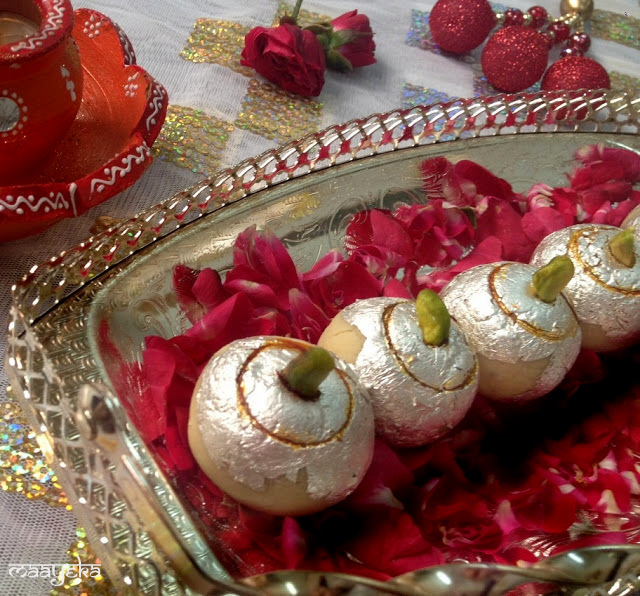 Check and switch off the flame and then add cardamom powder to it. 4] Now add cashew powder and milk powder to the sugar syrup and mix well. 5] When this mixture cools down to room temperature - knead and mash the dough to make it smooth, and then make small balls from the cashew dough. 6] For stuffing, take gulkand (rose jam) make small balls of the stuffing (smaller then the cashew dough balls). 7] Take a cashew ball and flatten it on your palm and stuff the gulkand ball in it and close it from all the sides and make a smooth and neat ball. 8] Stick silver foil (silver vark) on the balls and make a ring of saffron paste by dipping a small bottle's cap in the saffron paste and gently pressing it on the top of cashew ball. 9] Garnish with a pistachio slice on top and serve.